Nothing like a giveaway to see a crazy spike in traffic- welcome to all my new friends and followers! If you didn’t already enter, go check out my Big Birthday Bloviversary Giveaway! Speaking of friends, this is one of my very favorite aspects of being part of the nail polish community. I’ve made so many wonderful, close friends over the past year and a half. And the polishes in this post came from 2 of them! My awesome friend Peita is super sweet, and is also the genius behind Peita’s Polish. I have a few of her creations now, including the original Miss Dixie, and now the reformulated version that is part of the giveaway! We’ve been sending each other enormous swap packages back and forth for over a year now- if you love swapping, I really encourage girls (or guys!) to find ‘polish pen pals’ in other countries! Enchanted Polish Seven Nation Army was a birthday gift from my friend Jen of Jen’s Nail Files- who is also incredibly sweet and generous (and also loves to swap- if you’re new to swapping, Jen tends to find you! If you love candy, she’s your girl for sure!). Anywho- first up is Peita’s Polish Miss Dixie! 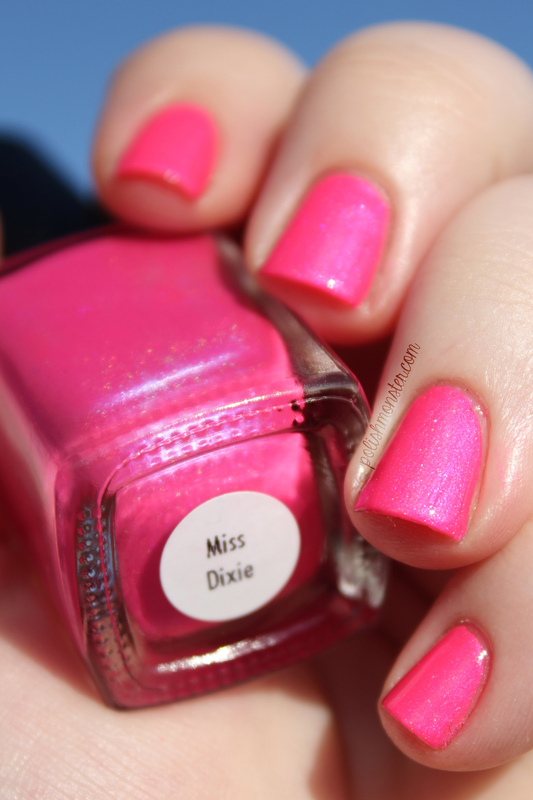 Miss Dixie is a neon pink holographic polish with a faint blue flash. The holo effect is subtle, but it adds a beautiful shimmery sparkle throughout. Application was great- it was almost fully opaque at just 1 coat, but 2 made it perfect. Photos show 2 coats plus topcoat. Then I added 1 coat of Enchanted Polish Seven Nation Army on top of Miss Dixie! Seven Nation Army is a holographic topcoat filled with itty bitty black and white hex glitters. All of the glitters are very small, which makes it a bit different than most black and white glitter offerings. Application was good, as you can see I got a good amount of glitter with just 1 coat. I did a tiny bit of dabbing to ensure I didn’t have a large empty spot, but otherwise the glitter went on with regular brush strokes. There’s only one downside to these polishes- neither are the easiest to get! I know, I’m sorry for that. Peita’s Polish is an Australian indie brand- though she DOES ship internationally! You’ll just be paying a bit more (if you’re in the US) for shipping and have to wait patiently a bit longer. Enchanted Polish- well, I think most of us know how challenging Enchanted Polishes can be to snag 🙂 Monthly restocks are fast and furious, and there’s not always a guarantee a particular color will be restocked. I feel it’s worth it- but it can be stressful and intimidating if it’s your first time (or 50th time). Polish Monster’s Big Birthday Blogiversary Giveaway! Well, it’s unsurprisingly a little later than I planned- but it’s finally here! My giveaway! My big 3-0 birthday was at the end of August, and my blog turned 1 year old at the end of June. My blog’s birthday sort of snuck past me, and so I decided to celebrate it alongside my birthday! I’ve always loved the movie 13 Going on 30, so for my 30th I decided to run with that as the theme. You’ll notice a few of the prizes are inspired by it! Enough talking- on to the prizes you could win! 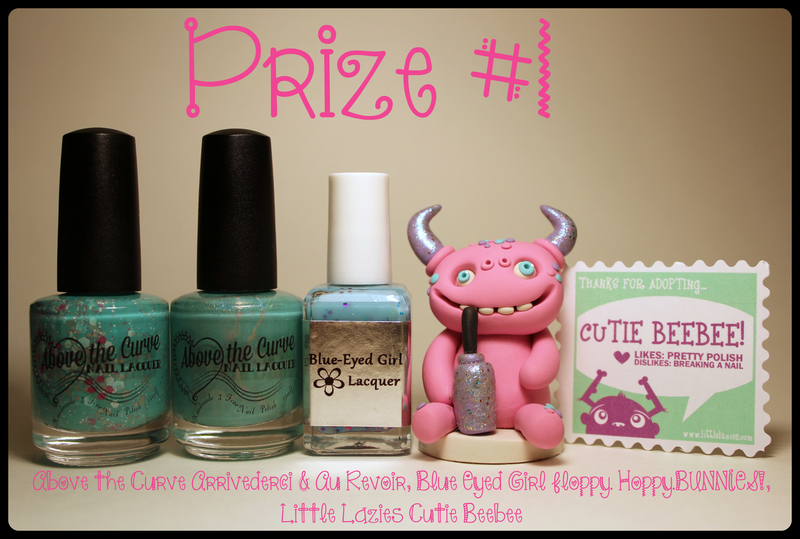 Prize #1 contains the Above the Curve duo Arrivederci and Au Revoir, Blue Eyed Girl Lacquer Floppy. Hoppy. BUNNIES! and a custom Little Lazy called Cutie Beebee! 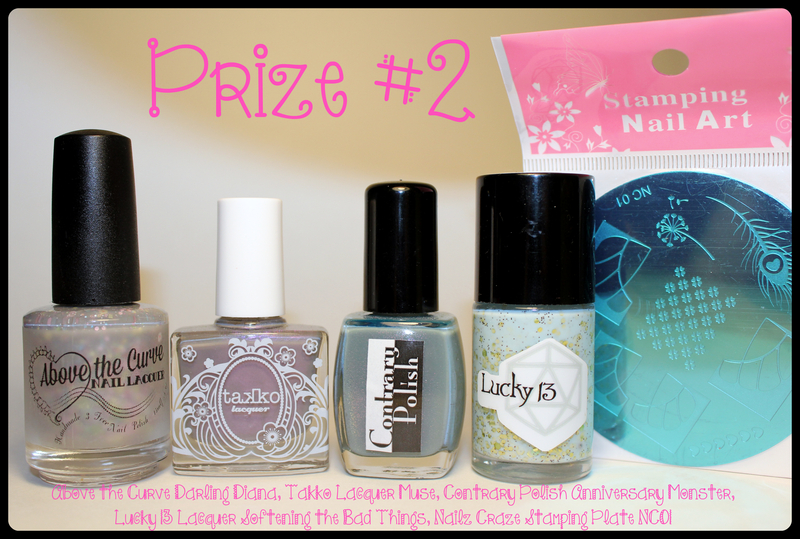 Prize #2 Contains Above the Curve Darling Diana, Takko Lacquer Muse, Contrary Polish Anniversary Monster, Lucky 13 Lacquer Softening the Bad Things, and Nailz Craze stamping plate NC01! 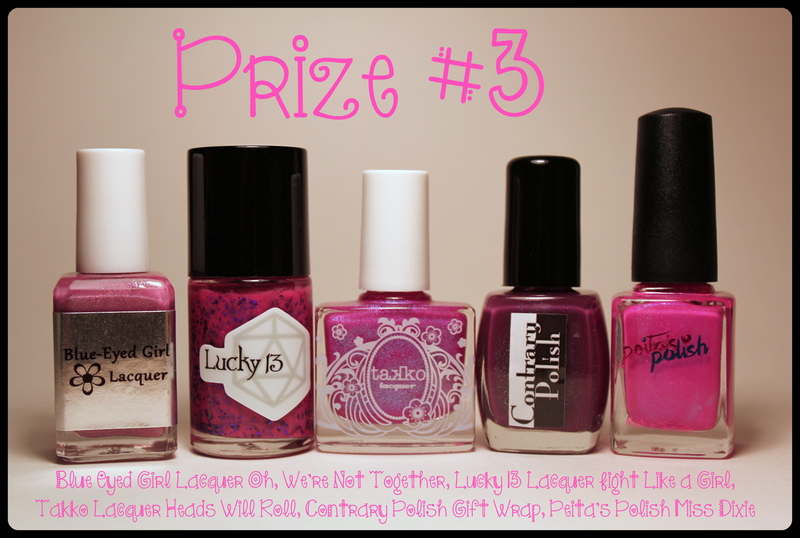 Prize #3 contains Blue Eyed Girl Lacquer Oh, We’re Not Together, Lucky 13 Lacquer Fight Like a Girl, Takko Lacquer Heads Will Roll, Contrary Polish Gift Wrap, and Peita’s Polish Miss Dixie! And last but not least- each prize pack gets these! A custom For Goodness Grape lip shimmer in Razzle Red (it’s a red, shimmery lip tint with a razzleberry flavor), and 2 Monster Polishes (that’s what my own polishes are called, for those that didn’t know!) made specifically for these events. Please excuse the lack of labels in the photo- I just ordered some new ones that will arrive before the giveaway ends! The first is Razzle Red, which I created for my birthday. It’s a glitter topcoat filled with every shape, shade and size of red and pink glitter I had in my glitter tub with a pink shimmer. The second is Monster’s Ball, which I created for my blog’s anniversary. It’s a frosty holographic purple polish filled with color shifting glitters and flakes. Swatches of both of these will be on the blog in the next few days! And now onto the official stuff. This giveaway will be conducted via Rafflecopter. There will be 3 winners and this is open internationally! This giveaway will end October 10, 2013 at 11:59pm CST. The winners will be announced here, as well as on Facebook and emailed (please be sure your Rafflecopter email address is accurate). The winners will have 48 hours to respond to me or a new winner will be chosen in their place. I am not responsible for lost/damaged deliveries. Winners will randomly paired with prizes, though preferences will be taken into account (but not guaranteed). All products are new and unused. The only required entry for the giveaway is following my blog (polishmonster.com) via email or Blog Lovin’. Additional entries can be gained through following on other social media outlets, following Facebook/Twitter pages of the brands featured in the prizes, and sharing the giveaway on social media. Some of the prizes in this giveaway were donated to me for the purpose of this giveaway, and others I purchased myself. I will be verifying winning entries, so please don’t lie. I’ve had to throw out winning entries with every giveaway in the past because people have lied about finishing tasks- it makes me sad. Please don’t do it! If you cannot enter using Rafflecopter, please leave me a comment and/or email with your information and I can enter it manually for you. Please follow the link RIGHT BELOW THIS to enter!!! And GOOD LUCK!!! Next to last post before my Blogiversary/Birthday giveaway goes LIVE tomorrow!!! I’ll be posting again to show off the very last polish included in the giveaway (that isn’t one of my own), but I won’t make everyone wait any longer! These 2 beauties are custom polishes Angel and Shaun at Above the Curve came up with for me special for this occasion! My favorite colors are pink (which is obvious to most people I’m sure), grey, mint, and tiffany blue. I especially wanted a mint/tiffany blue holo, since I adore holos from ATC. These are the two matching polishes they came up with! First up is Arrivederci- a minty cream filled with neon pink, white and grey glitters. This is just 1 coat over Au Revoir (shown below). And second we have Au Revoir, a minty holographic polish! These two will come together as a pair for one of the prizes 🙂 Check back tomorrow to see everything and enter! You can find Above the Curve polishes in their Big Cartel store, their Etsy store, and also at Overall Beauty. You can also follow the ATC Facebook page for news and updates. These polishes were customs, but they have TONS of beautiful polishes to pick from! The other day I wore Mentality Nail Polish in Fervor for the first time- though I’ve had it for awhile. I’m not sure why I waited so long to put it on (other than just being lazy)- talk about stunning in the sun! Fervor is part of Mentality’s Brilliant Holo collection- all of the Brilliant polishes are over the top shimmering, sparkling holographic beauties. Fervor is a light purple holographic shade with a splash of blue sparks. Fervor went on great, smooth and even and fully opaque in 2 coats. Mentality Polish has a lot of pretty shades, but I really feel like the Brilliant Holos are must haves- everyone should have at least one. With 9 shades to choose from, you’re sure to find a favorite! I also have Bliss, which is just as beautiful. You can follow Mentality Nail Polish on Facebook, and buy from their Big Cartel store. Be sure to check out and follow them- they currently have a Birthday Sale going on! Too-Cute-icle Bikini and Girly Bits Jini Goes Indie! 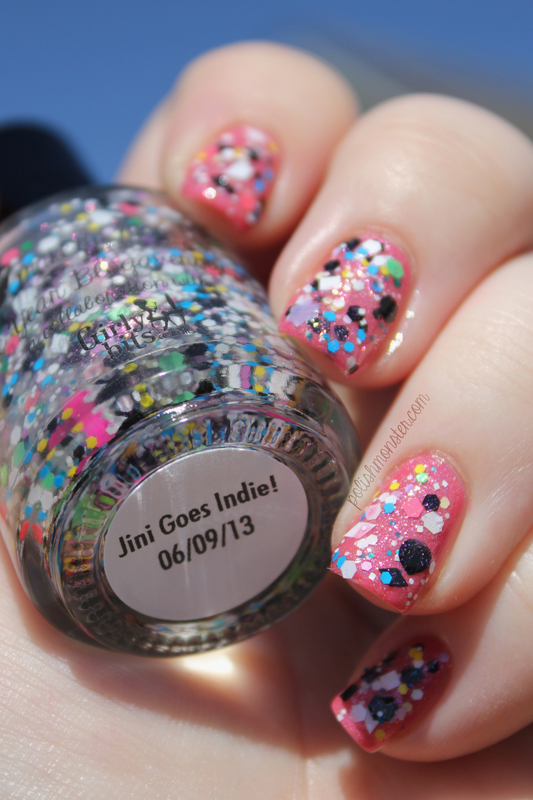 Tonight I’m showing off 2 polishes- Too-Cuticle’s Bikini and Girly Bits Jini Goes Indie! 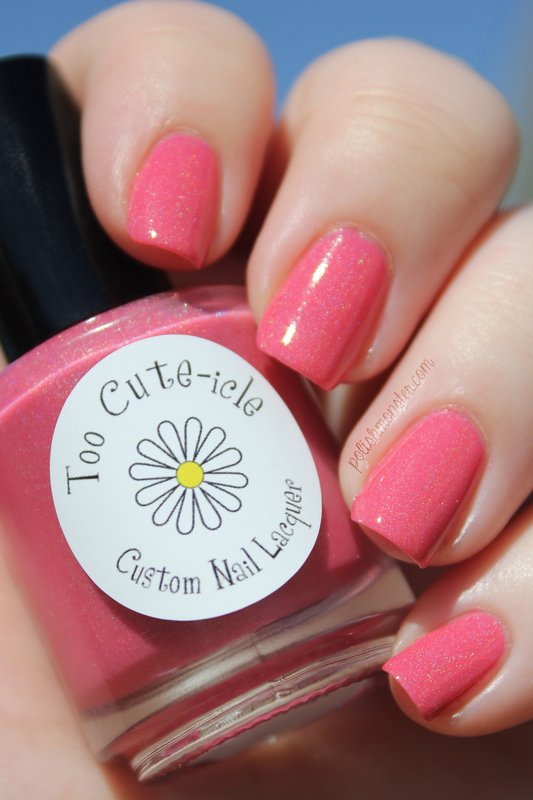 First up is Too-Cuticle Bikini! Application was great, I used 2 coats plus topcoat with no need for cleanup. Then I decided to top it with Girly Bits Jini Goes Indie! Jini Goes Indie! was a collaboration between Girly Bits and my friend Jini of Makeup Mom123! 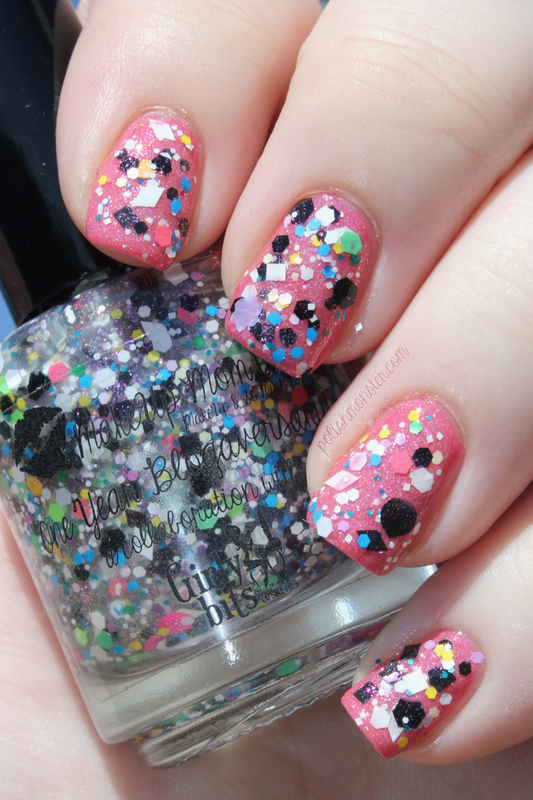 This is a fun glitter bomb filled with every color and shape you can think of! It also has a gorgeous pink shimmer throughout. Application was ok- I found it a little thick, but a bit of dabbing placement and 2 coats gave me a good glitter coverage! 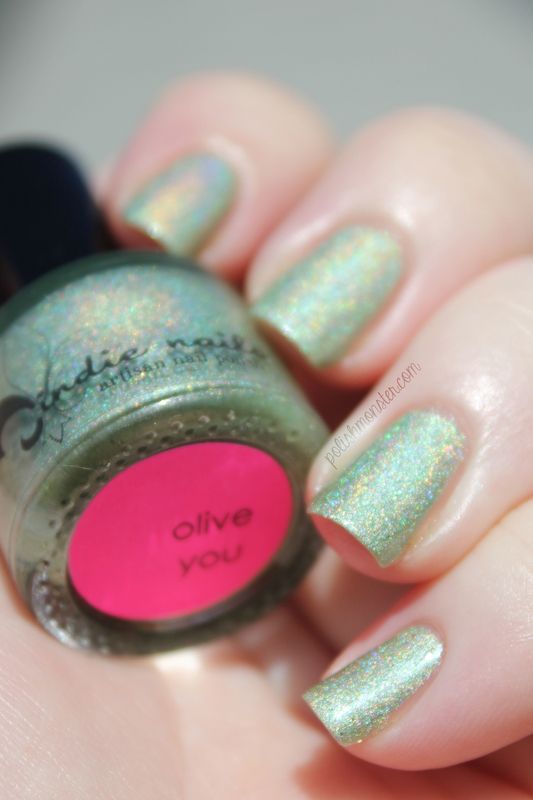 Today I’m going to show off one of my more recent purchases- Jindie Nails Olive You. 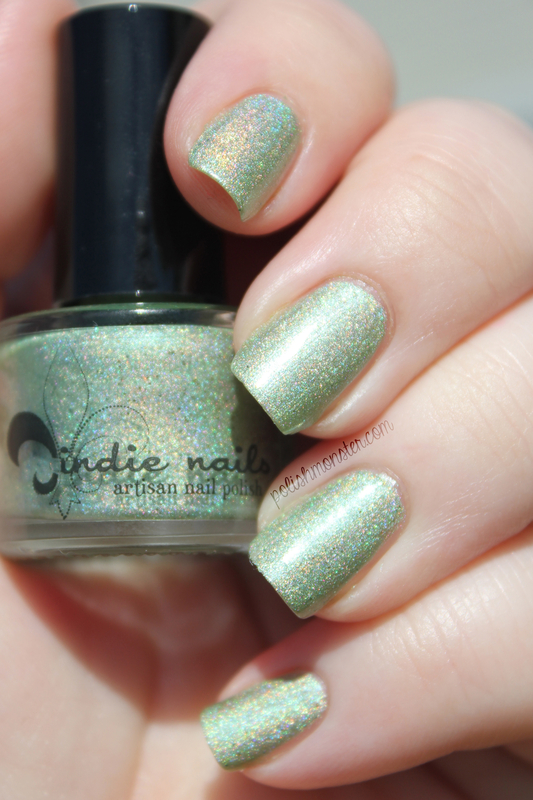 Olive You is an olive green linear holographic polish filled with small green/gold color shifting glitters. Pictures show 2 coats with no topcoat. Because of the glitters, Olive You shimmered and sparkled inside in the shade, and burst to life outside in the sun. Application was great, everything went on smooth and well. Isn’t it gorgeous? This will be a great shade for fall! Tonight I have a quick post showing some photos of another prize in my giveaway (I PROMISE it will start in a few days- the last prize is on it’s way to me!). A few months ago Kyoti of Lucky 13 Lacquer released a new polish, called Fight Like a Girl. I fell in love with it instantly- because hello, it’s bright pink and purple. And then I read a bit further about why this polish came to be, and I knew I had to grab one immediately- and I bought a second to give away in my giveaway. More money for a worthwhile cause is a good thing. 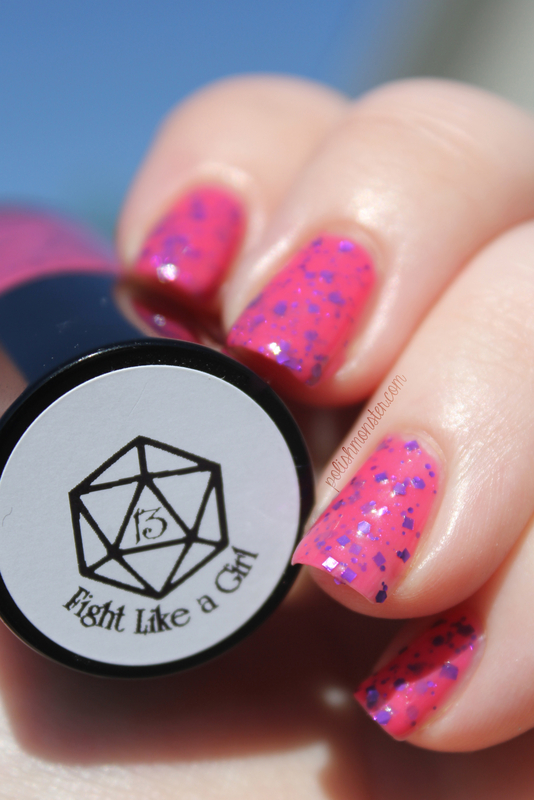 Fight Like a Girl is a gorgeous hot pink jelly polish filled with shimmer and bright purple metallic glitters. Application was wonderful- it applied perfectly, needed no cleanup, and was opaque in 2 coats. Photos show 2 coats with no topcoat. Of course I’ll be giving away one of these gorgeous polishes in my giveaway, but if you would like to purchase your own bottle you can find them here at Lucky 13 Lacquer’s store. Remember, Kyoti gives $4 from every full size and $3 from every shortie directly to her sister and her family. You can follow Lucky 13 Lacquer on Facebook to keep up to date on new releases and other information. This polish will be paired with another amazing Lucky 13 Lacquer in the giveaway- Softening the Bad Things. This is a polish very special to me, for reasons I’ll go into later (but that’s a blog post on it’s own- but if you want to get the gist, just see Accio Lacquer’s review of it, and that sums up a whole lot of why I adore it). As another disclaimer- some prizes in this giveaway were donated, but some- these 2 in particular- were purchased by me. So the monetary donations associated with both did occur.